A dangerous new friend: instant home-made cake. I try. I really try. To not eat much sugar and to be healthy. But then I find out about things like Five Minute Chocolate Cake and I can't resist having just a little quick dessert after dinner. The consistency is a bit dense, but hey: it's a five minute cake! 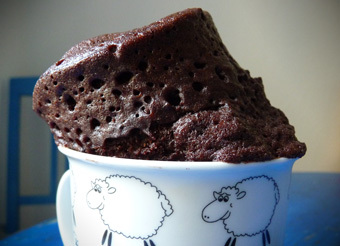 Combine the dry ingredients in a microwave safe mug or dessert bowl. Whisk in an egg and add milk and butter – mix well. Put the mug in the micro wave oven, blast for three minutes on full power (about 1000 watt). Wait until the cake stops rising and sets, then tip the cake over to a plate and enjoy! You might need to try a few times to find out the perfect time with your specific microwave oven settings. Also, don't skimp on the sugar, you really need to have four table spoons, even if it sounds crazy to have the same amount of flour and sugar in a cake. If you use oil instead of butter this is a one pot wonder, so to speak, but the taste won't be as nice – up to you!